Inland Building Systems has completed renovating the Cullman, Alabama manufacturing facility. This is now a state of the art manufacturing facility. Both Inland Building Systems and our parent company, Schulte Building Systems, are shipping products from the Cullman facility. Since re-opening the Cullman manufacturing plant, over 130 employees have been added. This indicates Inland Building Systems, and Schulte Building Systems, dedication to the southeastern and mid-western metal building customers. On your next metal building project, if you are not presently associated with Inland Building Systems, give us a try and be a part of the Recovery Growth Team. We are confident that we will make your next metal building project more successful. 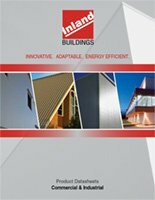 Contact us at sales@inlandbuildings.com and we will have the Inland Building Systems’ district manager contact you, or use the convenient District Manager Locator page here.